Hoo boy. While Red Dead Online updates usually bring the goods, this week's update is mighty slim, like a cowboy who's been out on the range for a week without food. It's, simple, really: all the Fence outposts across the Wild West are selling weapons at a 25% discount this week, so it's a great time to load up on firearms and melee weapons while the gettin's good. 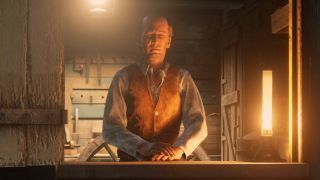 "A network of dealers in illicit arms and supplies with outposts all across frontier America, Fences are the place to buy and sell all manner of goods, from hunting baits to crafting pamphlets all the way to brutal, harder-to-find weapons like the Tomahawk or the Machete," reads Rockstar's official update post. "Sidle up to your local Fence in the Red Dead Online Beta this week for a special 25% discount on all their available weapons. And to grease the wheels even further, Fences have lifted Rank requirements on weapon inventory." Once you've stocked up on weapons, you can show your horses some love, as Saddles and Horse Care items at Stables and in the Wheeler, Rawson and Co Catalogue are all 25% off as well. Isn't it time you treated your trusty steed to a bit of pampering, as thanks for carrying your dusty behind every which way? Unlike GTA Online, which can fall back on years' worth of updates when there isn't much new stuff to highlight (like the revisit of The Doomsday Heist in the latest GTA Online patch notes), Red Dead Online is still building out its stable of events and modes. Hopefully this quieter couple of weeks just means that big stuff is headed our way in the pipeline. Check out our Red Dead Online tips before you get yourself killed, or watch the video below to see what we think of the single-player story of Red Dead Redemption 2.